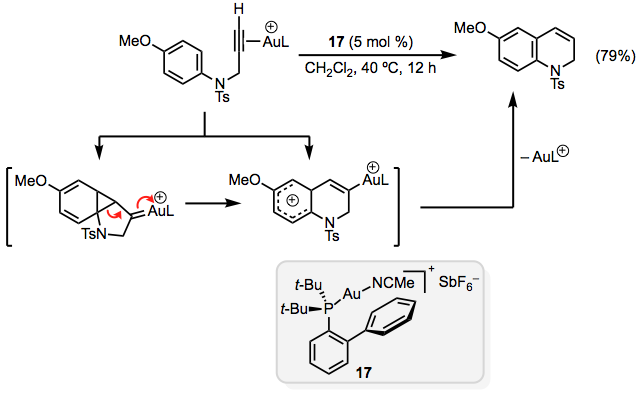 Gold-catalyzed cyclization reactions involve the activation of alkynes by gold(I) followed by attack of a pendant nucleophile. These reactions may be used to construct complex cyclic skeletons under mild conditions. Gold(I) complexes exhibit a strong affinity for carbon-carbon π-bonds, a phenomenon that has been attributed to relativistic effects. 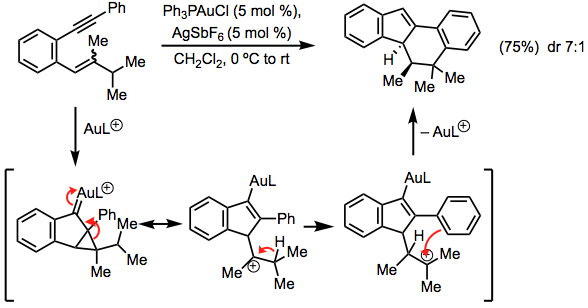 Coordination of gold to an alkyne, alkene, or allene increases the electrophilicity of the unsaturated group, promoting Markovnikov-type addition of a nucleophile affording vinylgold species 1 (Eq. 1). When an alkene serves as the nucleophile, a cyclization process occurs. Although these reactions resemble polyene cyclizations promoted by protons or Lewis acids, they typically do not proceed through open carbocation intermediates. Strongly electron-donating ligands such as N-heterocyclic carbenes encourage back-donation from gold, leading to cyclopropyl gold(I) carbenes 2 that behave like non-classical carbocations (Eq. 2). Skeletal rearrangements of these species can afford a variety of carbocyclic products whose structures depend on the structure of the enyne starting material and whether cyclization occurs in an exo or endo fashion (Eq. 3). In addition to all-carbon cyclizations such as those highlighted above, pendant heteroatomic nucleophiles may also participate in these reactions, leading to polycyclic products. Despite the high cost of gold, the rapid increase in structural complexity and mild reaction conditions associated with gold-catalyzed cyclizations have made this class of reactions an attractive option for organic synthesis. Reactions of gold(I) complexes are in some ways complementary to those of Brønsted acids and other transition-metal complexes. 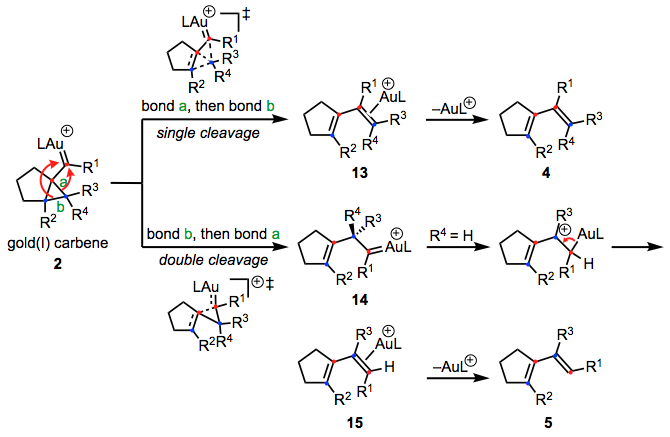 The combination of an enyne with a gold(I) complex results in an equilibrium between alkene- and alkyne-coordinated gold(I) species. The latter intermediate can engage in a variety of mechanistic pathways that differ in the reorganization of bonds following a cyclization step. Steps following the initial cyclization event may leave the carbons of the original alkene and alkyne connected ("no cleavage"), break the bonds between the alkene carbons only ("single cleavage"), or break the bonds between the alkene and alkyne carbons ("double cleavage”). In products of single-cleavage reactions, the alkyne carbons end up between the separated alkene carbons. In products of double-cleavage reactions, the alkyne and alkene carbons are arranged in an alternating pattern (see below). Cyclizations may also differ in the alkyne carbon that undergoes nucleophilic attack: endo cyclization positions both alkyne carbons within the newly formed ring while exo cyclization leaves one of the alkyne carbons outside of the newly formed ring. Eq. 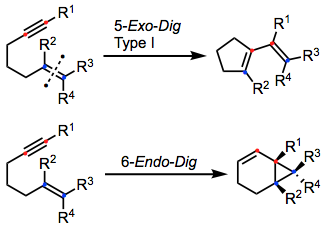 4 below shows three variants of 5-exo-dig cyclization of 1,6-enynes, of which compound 3 is a general example. Type I cyclization is a single-cleavage process that affords alkenyl cyclopentenes 4. When R4 = H, cyclization and double cleavage yield a different alkenyl cyclopentene 5. Type III cyclization appears to involve endo ring closure based on the structure of cyclohexene 6, but in fact results from exo ring closure followed by single-cleavage rearrangement. 6-Endo-dig cyclizations of 3 are shown in the first two reactions of Eq. 5 below. 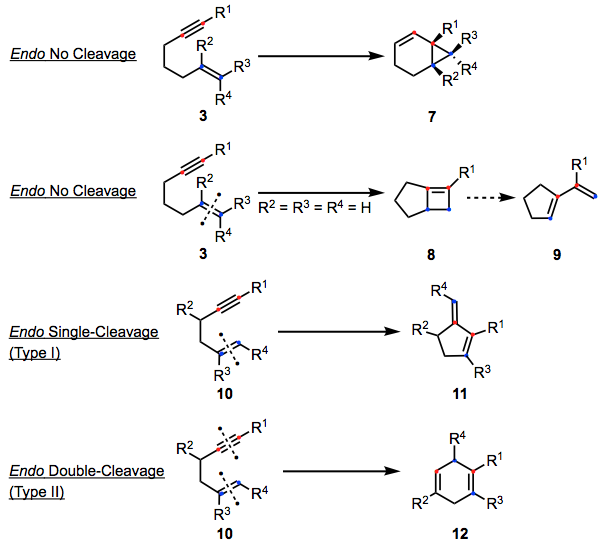 Endo cyclization followed by no-cleavage rearrangement may afford either bicyclo[4.1.0]heptenes 7 or fused cyclobutenes 8, which could give rise to alkenyl cyclopentenes 9. The third and fourth reactions in Eq. 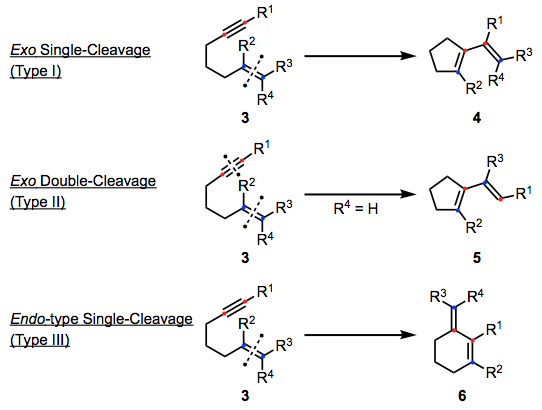 5 depict single- and double-cleavage reactions of 1,5-enynes. Density functional theory calculations have shed light on the single- and double-cleavage reactions of 1,6-enynes. Following the formation of an η2-alkyne–gold(I) complex, 5-exo-dig cyclization affords cyclopropyl gold(I) carbene 2, which can also be represented as a gold-substituted cyclopropylmethyl cation or homoallylic cation (see Eq. 2 above). The single-cleavage skeletal rearrangement most likely occurs by the formal opening of 2 to form η2-diene–gold(I) complex 13 in a single step. The terminal carbon in the alkene migrates to C(1) of the alkyne with cleavage of bond b. Double-cleavage rearrangement begins with the skeletal rearrangement of 2 to gold(I) carbene 14. When R4 = H, a 1,2-hydride shift followed by elimination of gold affords diene–gold(I) complex 15; dissociation of gold then gives product 5 containing the alternating bonding pattern characteristic of double cleavage (Eq. 6). Chiral gold(I) catalysts have been used in the development of intramolecular reactions. For example, a chiral dinuclear gold(I) complex with the (S)-3,5-xylyl-MeO-BIPHEP ligand catalyzes cycloisomerization or cyclization-addition of 2-alkynyl styrenes (Eq. 7). The intermolecular reaction of alkenes and alkynes in the presence of a gold(I) catalyst typically affords cyclobutenes by formal [2+2] cycloaddition. Enynes react in intramolecular cycloisomerization processes in the presence of similar catalysts, leading to a variety of products dependent on the structure of the enyne, the gold(I) catalyst, and the reaction conditions. 1,5-Enynes most often react by endocyclic pathways; endo-cyclization of 1,5-enynes affords bicyclo[3.1.0]hexanes in a no-cleavage process (Eq. 8). The cyclopropyl gold(I) carbene intermediates characteristic of these cycloisomerization reactions are subject to carbocation-like rearrangements, as they have some carbocationic character (see Eq. 2 above). 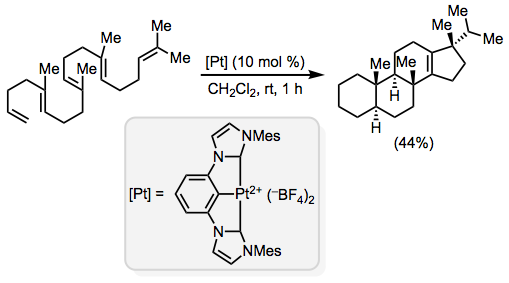 For example, a 1,2-hydride shift following cyclization of the substrate below enables Friedel-Crafts-type cyclization of the pendant phenyl ring, giving a tetracyclic ring system (Eq. 9). Non-classical carbocations also arise in some reactions of this type, for example when a cyclopropene is involved as the ene component. Cycloisomerizations of 1,6-enynes are generally more sensitive to changes in the structure of the substrate or catalyst. For instance, the presence of a nucleophile within the substrate (including a migratory C–C bond) can affect the outcome. In the example below, cyclization initially affords a spiro intermediate and C–C migration results in ring expansion (Eq. 10). The substitution pattern of the alkene influences the outcome of these reactions as well. Gold(I) catalysts are effective for the exo single-cleavage cycloisomerization of 1,7-enynes. This class of substrates has been under-explored relative to 1,5- and 1,6-enynes. Enynes containing enamines or enols also engage in cycloisomerization reactions in the presence of gold(I) catalysts. For example, enols derived from β-ketoesters cyclize in a process resembling the Conia-ene reaction in the presence of triphenylphosphine gold(I) chloride and silver triflate (Eq. 11). The products of cyclizations of silyl enol ethers containing tethered alkynes depend on the identity of the ligand; internal 1,6-enynes react in an exo fashion when an N-heterocyclic carbene is used, but employing a phosphine results in strong selectivity for endo cyclization. Cyclopropyl gold(I) carbene intermediates can themselves act as cyclopropanating species in an intra- or intermolecular fashion. For example, when dienynes are used as substrates, cyclization followed by intramolecular cyclopropanation results in an significant increase in molecular complexity in a single step. Intermolecular cyclopropanation of alkenes has also been observed (Eq. 12). Cyclopentenones are obtained by treatment of propargylic 1,3-enynes with triphenylphosphine gold(I) chloride as catalyst (Eq. 13). 1,3-Migration of acetate gives a pentadienyl cation, which engages in Nazarov-type cyclization to afford a cyclic conjugated gold(I) carbene. Hydride shift followed by hydrolysis affords the cyclopentenone product. Nazarov-type cyclizations of pentadienyl cations containing gold also appear in reactions of larger enynes containing propargylic carboxylates. 1,5-Enynes react with alcohols or water in the presence of a gold(I) catalyst to afford the corresponding cyclized adducts. Pendant nucleophiles can also participate in intramolecular addition during gold-catalyzed cyclizations of enynes. For example, intramolecular alkoxycyclization of hydroxy-1,5-enynes affords cyclic ethers (Eq. 14). Carbon nucleophiles such as β-dicarbonyl compounds, alkenes, and arenes can react in a similar manner. Electron-rich arenes are capable of opening cyclopropyl gold(I) carbenes to afford cyclized products. Gold(I) phosphine catalyst 16 is effective in cyclizations of amines that yield pyrrolidines (Eq. 15). 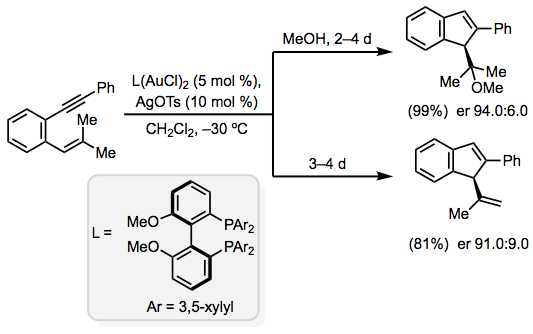 Aryl- and heteroarylalkynes can themselves engage in cyclization in the presence of a gold(I) catalyst, with the arene acting as the ene component. These reactions can be envisioned as electrophilic aromatic substitutions promoted by coordination of the alkyne to gold. For example, N-Tosyl-1,2-dihydroquinolines are the products of cyclization of N-propargyl-N-tosyl anilines using cationic gold(I) catalyst 17 (Eq. 16). Indoles and furans may react similarly, with the latter typically rearranging to yield phenols. Gold-catalyzed cycloisomerization reactions often result in a rapid increase in molecular complexity under mild reaction conditions. As a result, these reactions have been applied in organic synthesis for the construction of a variety of heterocyclic systems. The total synthesis of hyperforin was achieved using a gold-catalyzed Conia-type reaction, which was performed on multigram scale (Eq. 17). One type of cycloisomerization of enynes containing propargylic carboxylates known as the Rautenstrauch rearrangement was applied in the synthesis of 2-sesquicarene for the construction of the bicyclo[4.1.0]heptene ring system in the target (Eq. 18). Gold(I) complexes are generally the most functional-group tolerant and broadly applicable of transition metal catalysts for activation of alkynes; however, the ene component in gold(I)-catalyzed cycloisomerizations is generally limited to electron-rich alkenes and arenes. Gold(I) complexes may not be the catalysts of choice if activation of an alkene is desired. For example, platinum(II) complexes can activate polyunsaturated substrates in a manner complementary to gold(I) involving activation of the terminal alkene (Eq. 19). Brønsted acids similarly activate alkenes by protonation in acid-catalyzed cyclization reactions. Acid-catalyzed cyclizations generally proceed by protonation of the alkene followed by nucleophilic attack by the alkyne; however, these reactions are limited to substrates that form stabilized alkenyl carbocations. In the example below, the alkenyl cation is captured in a Friedel-Crafts-type step (Eq. 20). Complexes of ruthenium(II), rhodium(II), and other transition metals catalyze the formal [2+2] cycloaddition of alkenes and alkynes to form cyclobutenes. Although analogous reactions of gold(I) complexes are limited to electron-rich alkenes, other catalysts are effective in reactions of electron-poor alkenes. For example, a rhodium(II) complex catalyzes the cycloaddition of α,β-unsaturated esters with alkynes (Eq. 21). Gold(I)-catalyzed cycloisomerizations should generally be carried out under an inert atmosphere of nitrogen or argon using dry solvents. If silver salts are used to generate an active cationic gold(I) catalyst, these are typically added after the gold(I) precatalyst and substrate to prevent the formation of less reactive bridged species. Under N2 atmosphere, the silyloxy 1,5-enyne (68 mg, 0.20 mmol) was dissolved in CH2Cl2 (4 mL) and treated with AuCl (0.5 mg, 0.002 mmol, 1 mol %). The resulting solution was stirred at 20 °C for 30 min. After treatment of the reaction mixture with a drop of Et3N, the solvent was removed under reduced pressure, and the crude product was purified by column chromatography on silica gel to provide the title product (50 mg, 73%): 1H NMR (400 MHz, CD2Cl2) δ 7.43 (d, J = 7.1 Hz, 2H), 7.32 (dd, J = 7.3, 7.1 Hz, 2H), 7.23 (t, J = 7.3 Hz, 1H), 6.08–6.05 (m, 1H), 3.08 (t, J = 7.5 Hz, 2H), 2.99–2.94(m, 2H), 1.73 (s, 3H), 1.23–1.06 (m, 21H); 13C NMR (100 MHz, CD2Cl2) δ 141.3, 141.2, 134.3, 128.6, 127.2, 125.2, 121.2, 107.9, 35.1, 32.9, 18.2, 15.9, 13.6; IR (neat) 3030, 2944, 2867, 1706, 1639, 1579 cm–1; MS–APCI (m/z): [M + H]+ calcd for C22H35OSi, 343.25; found, 343.3. ↑ Echavarren, A. M.; Nevado, C. Chem. Soc. Rev. 2004, 33, 431. ↑ Nieto-Oberhuber, C.; López, S.; Mu�ñoz, M. P:; Cárdenas, D. J.; Bu�ñuel, E.; Nevado, C.; Echavarren, A. M. Angew. Chem. Int. Ed. 2005, 44, 6146. ↑ Martínez, A.; García-García, P.; Fernández-Rodríguez, M. A.; Rodríguez, F.; Sanz, R. Angew. Chem. Int. Ed. 2010, 49, 4633. ↑ López-Carrillo, V.; Echavarren, A. M. J. Am. Chem. Soc. 2010, 132, 9292. ↑ Luzung, M. R.; Markham, J. P.; Toste, F. D. J. Am. Chem. Soc. 2004, 126, 10858. ↑ García-García, P.; Rashid, M. A.; Sanjuán, A. M.; Fernández-Rodríguez, M. A.; Sanz, R. Org. Lett. 2012, 14, 4778. ↑ Zhou, Q.; Li, Y. J. Am. Chem. Soc. 2014, 136, 1505. ↑ Simonneau, A.; Harrak, Y.; Jeanne–Julien, L.; Lemière, G.; Mouriès–Mansuy, V.; Goddard, J.-P.; Malacria, M.; Fensterbank, L. ChemCatChem 2013, 5, 1096. ↑ Cabello, N.; Rodríguez, C.; Echavarren, A. M. Synlett 2007, 1753. ↑ Staben, S. T.; Kennedy–Smith, J. J.; Toste, F. D. Angew. Chem. Int. Ed. 2004, 43, 5350. ↑ Barabé, F.; Levesque, P.; Korobkov, I.; Barriault, L. Org. Lett. 2011, 13, 5580. ↑ Nieto-Oberhuber, C.; López, S.; Muñoz, M. P.; Jiménez-Núñez, E.; Buñuel, E.; Cárdenas D. J.; Echavarren, A. M. Chem. Eur. J. 2006, 12, 1694. ↑ López, S.; Herrero-Gómez, E.; Pérez-Galán, P.; Nieto-Oberhuber, C.; Echavarren, A. M. Angew. Chem. Int. Ed. 2006, 45, 6029. ↑ Zhang, L.; Wang, S. J. Am. Chem. Soc. 2006, 128, 1442. ↑ Shi, X.; Gorin, D. J.; Toste, F. D. J. Am. Chem. Soc. 2005, 127, 5802. ↑ Zhang, L.; Kozmin, S. A. J. Am. Chem. Soc. 2005, 127, 6962. ↑ Menon, R. S.; Findlay, A. D.; Bissember, A. C.; Banwell, M. G. J. Org. Chem. 2009, 74, 8901. ↑ Hashmi, A. S. K.; Frost, T. M.; Bats, J. W. J. Am. Chem. Soc. 2000, 122, 11553. ↑ Bellavance, G.; Barriault, L. Angew. Chem. Int. Ed. 2014, 53, 6701. ↑ Faza, O. N.; Lopez, C. S.; Alvarez, R.; de Lera, A. R. J. Am. Chem. Soc. 2006, 128, 2434. ↑ Fürstner, A.; Hannen, P. Chem. Commun. 2004, 2546. ↑ Sakai, K.; Kochi, T.; Kakiuchi, F. Org. Lett. 2013, 15, 1024. ↑ Homs, A.; Escofet, I.; Echavarren, A. M. Org. Lett. 2013, 15, 5782. ↑ Zhang, L.; Kozmin, S. A. J. Am. Chem. Soc. 2004, 126, 11806. This page was last modified on 30 November 2017, at 21:35.